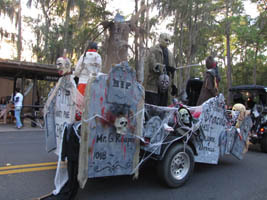 Some of the golf carts in the parade had a spooky theme (below, left). There were a lot of carts! We were able to watch the procession from a couple of different locations, including at the Meadows (below, right). 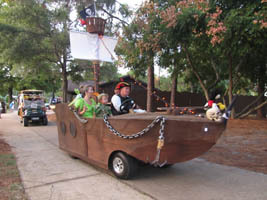 This pirate ship won first place in the contest (below, left). 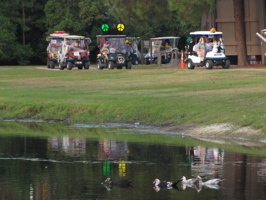 Another of my favorites was this Toy Story themed golf cart (below, right), led by Slinky Dog. 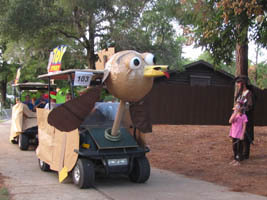 Video #1 – Disney Fort Wilderness Halloween Golf Cart Parade 2010 Part 1 of 2 – Fort Wilderness Halloween Golf Cart Parade 2010 Part 1, Walt Disney World. This was held on October 30th. 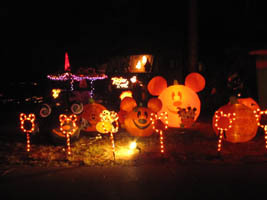 Video #2 – Disney Fort Wilderness Halloween Golf Cart Parade 2010 Part 2 of 2 – Campers from around Fort Wilderness take part, decorating their golf carts (sometimes very elaborately). 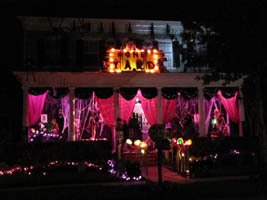 We walked around after dark, taking in the fun (below left) and more spooky (below, right) Halloween displays. 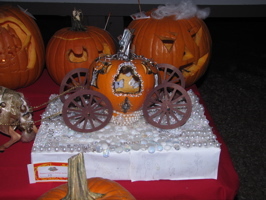 There was a pumpkin carving contest for guests as well. 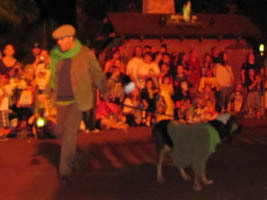 One of my favorites was the Michael Jackson carving (below, left), and Cinderella’s Coach was great as well (below, right). 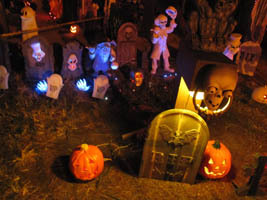 There were quite a few pumpkins entered! 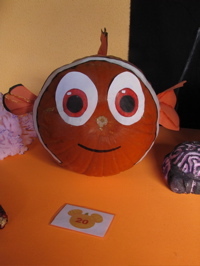 Video #3 – Disney’s Fort Wilderness Pumpkin Carving Contest Pumpkins 10/30/10 – Disney’s Fort Wilderness Resort had a pumpkin carving contest for the campers, these are the pumpkins in the running. We went to the Animal Kingdom Lodge’s Kidani Village and the Animal Kingdom Lodge’s Jambo House to check out the different pumpkins. 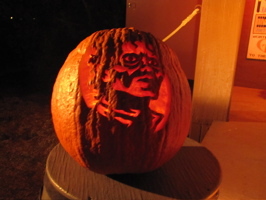 Not all resorts had pumpkin carvings, but many do. 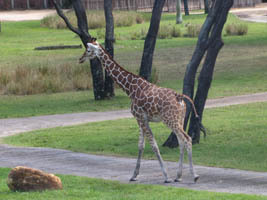 We took a moment to check out this giraffe (below, left) before heading back inside. 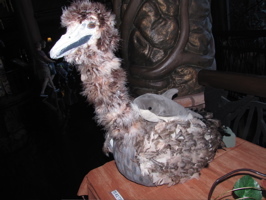 One of the most unique cast member creations was an ostrich coming out of the pumpkin (below, right). 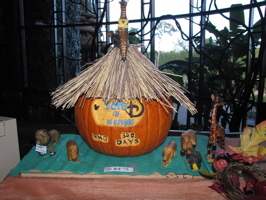 Another of our favorite Animal Kingdom Lodge pumpkins was this African themed display (below, left). 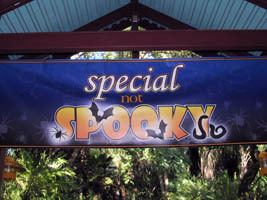 After the Animal Kingdom Lodge, we headed to the Animal Kingdom theme park – and we took the train to Conservation Station to see the Special not Spooky animal exhibits (below, right). 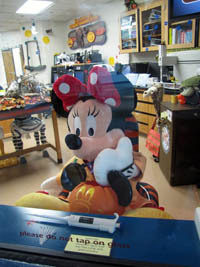 There was Halloween decorations everywhere, including of this Minnie with a familiar shaped pumpkin (below, left). 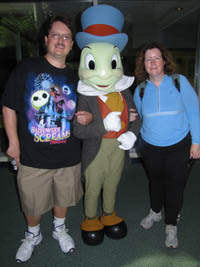 Denise from Mousesteps and I pose with Jiminy Cricket (below, left). There was no wait for him as the area wasn’t crowded. We were not expecting to see decorated pumpkins at Conservation Station. There were two rows of them! 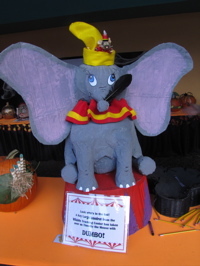 Dumbo (below, left) and Nemo (below, right) were two of maybe 20 pumpkins that cast members carved for guests to see and judge. They were sort of hidden in a corner and we were lucky to happen to see them. 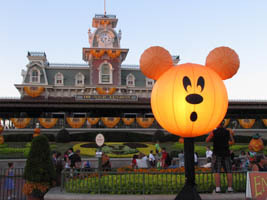 After Animal Kingdom, we stopped at Disney’s Coronado Springs Resort to take a look at their pumpkin display. 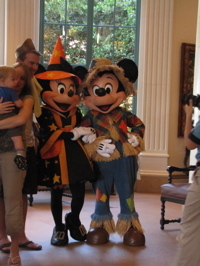 Scarecrow Mickey and witch Minnie (below, left) greeted guests before pumpkin Donald and princess Daisy (below, right) took their place. 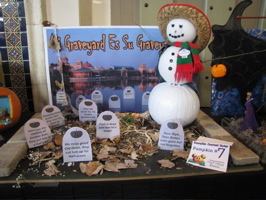 This snowman in a graveyard (below, left) was one of the interesting pumpkin carving displays at Coronado Springs. 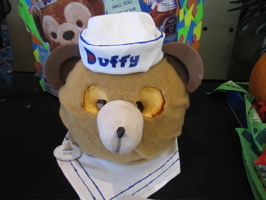 Duffy the Disney Bear (below, right) was the most timely! 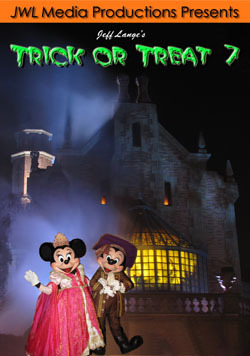 Video #4 – Carved Pumpkins, Mickey and Minnie Mouse Halloween Meet and Greet, Coronado Springs 10/31/10 – The video starts out with carved pumpkins in the Coronado Springs Lobby, followed by Mickey and Minnie Mouse dressed for Halloween and meeting guests. 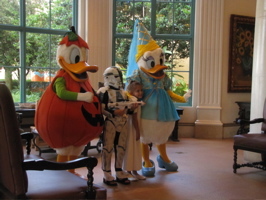 Disney’s Boardwalk Resort also holds a Halloween event, with a DJ, crafts, candy and more for resort guests. 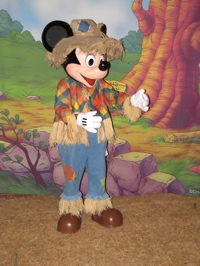 Scarecrow Mickey (below, left) also made appearances here. 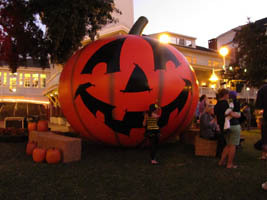 A giant inflated pumpkin (below, right) smiles at guests. This is a really fun event! We took a drive through Celebration on the way back from Disney, and there were several houses that were elaborately designed (below, left). 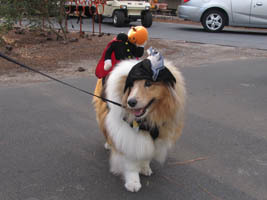 We really wanted to go to an amazing pirate themed house we were told about, but Celebration was the most crowded we’ve ever seen it with nowhere to park. Friends of ours invited us to join them for the November 1st Mickey’s Not So Scary Halloween Party (below, right), which ended up being a sell out (even though it didn’t feel very crowded). 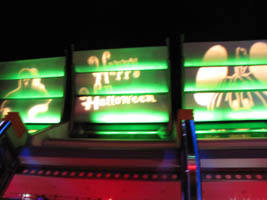 I didn’t remember the “Happy Halloween” lighting in Tomorrowland (below, left) from the first Parties we went to in early September. 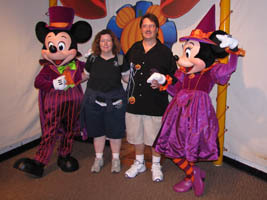 We visited with Mickey and Minnie Mouse (below, right), who were dressed in their purple Halloween finery. 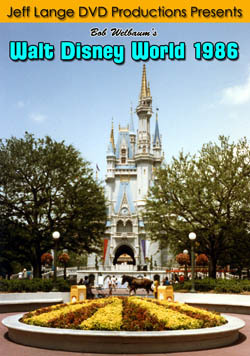 We’ve also seen Mickey and Minnie dressed in their pirate and princess outfits for Halloween at previous Parties! 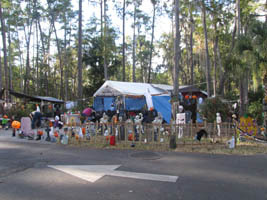 Where else but Walt Disney World can you celebrate Halloween one day, and Christmas just days later? 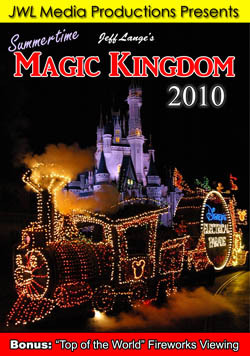 Mickey’s Very Merry Christmas Party kicks off on November 8th. 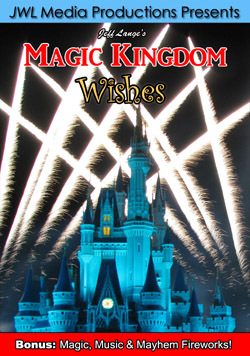 See ya real soon! 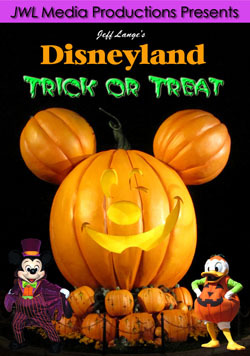 More Halloween Fun (Mickey’s Not So Scary Halloween Party’s 2003 – 2010 Available) 2010 Edition Available Now! 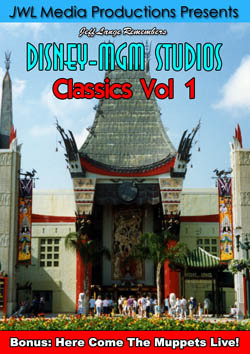 Jeff Lange presents this all-new DVD from the 2010 Mickey’s Not-So-Scary Halloween Party at Walt Disney World! 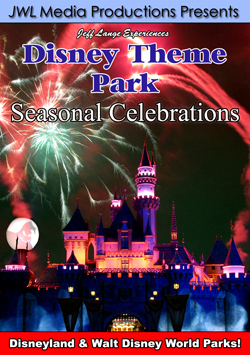 Featuring: Alice & Mad Hatters Treat Party, TheHeadless Horseman, Mickey’s Boo-to-You Halloween Parade, Happy HalloWishes Fireworks, Villains Mix and Mingle, Not So Scary Party Scenes, Haunted Mansion at Midnight and more!